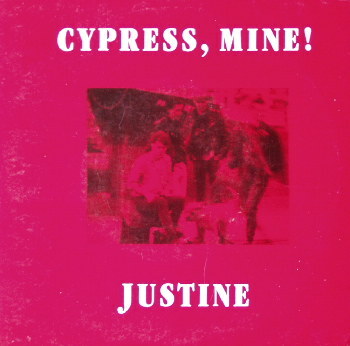 Irish Rock Discography: Cypress, Mine! 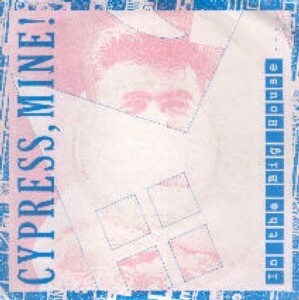 Cypress, Mine! 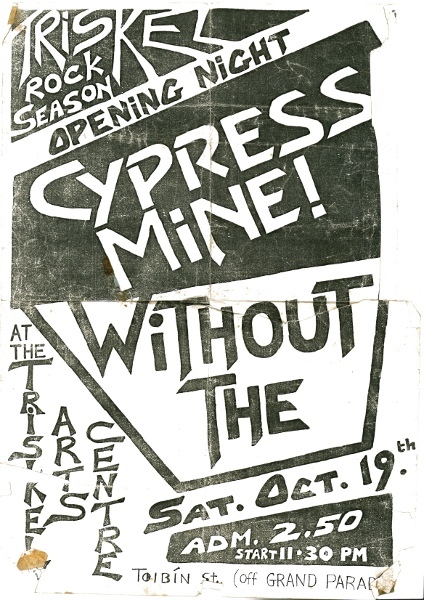 (or simply Cypress Mine) formed earlier than most people imagine, circa 1983, with original singer Sean O'Riordan. 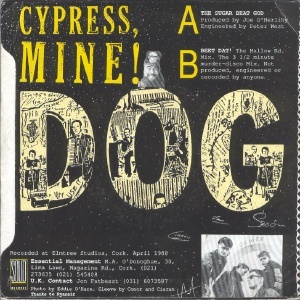 It's been suggested to me that the band that became Cypress, Mine! 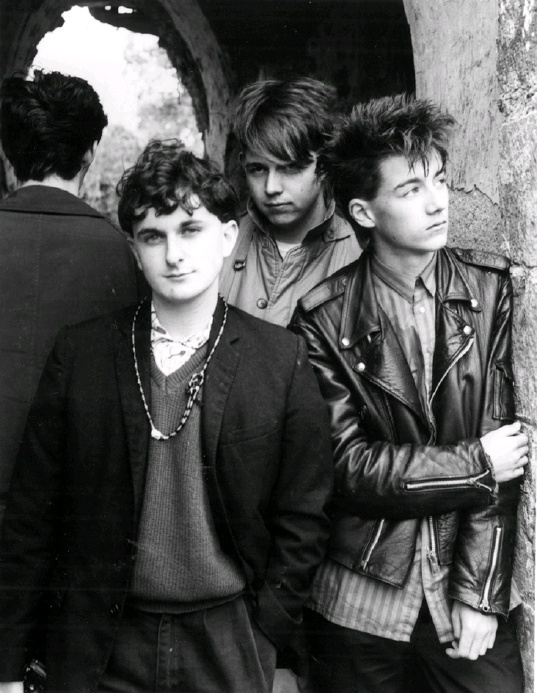 was in fact the last lineup of Urban Blitz, who were still active in 1983-84 but to my knowledge only Mark Healy played with this earlier outfit. Ciaran O'Tuama, who was known at the time as a photographer of the early punk rock scene in Cork [and official photographer of the Arcadia] replaced O Riordan sometime later. Their sound was influenced by some of the Postcard bands, e.g. 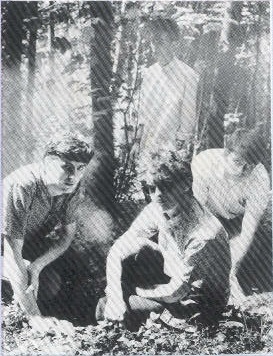 Orange Juice, Josef K, early Aztec Camera, etc. Ciaran wasn't the greatest singer in the world but their recordings have a certain quality that make them stand out. Their records are highly recommended but they have become impossible to find. 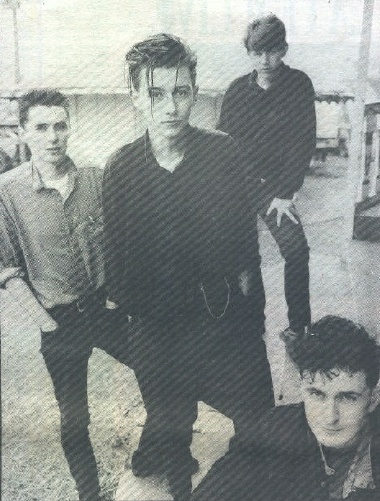 They were managed by Tony O'Donoghue of Hot Press (now a sports commentator). An Triskel, Cork, 19 October 1985. 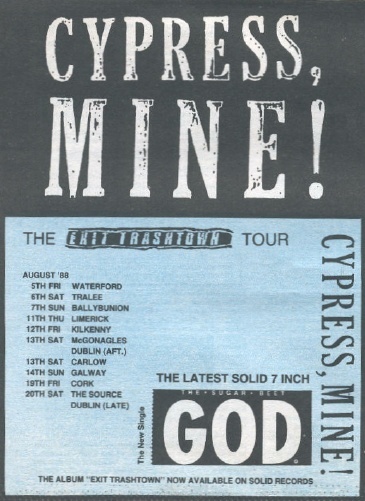 They first came to prominence during live shows in Cork in 1985. The played the Lark by The Lee (a free outdoor one day gig) that year with local bands The Stargazers and Porcelyn Tears and surprise headliner U2 (I remember Dave Fanning was hoarse for this radio show that night). 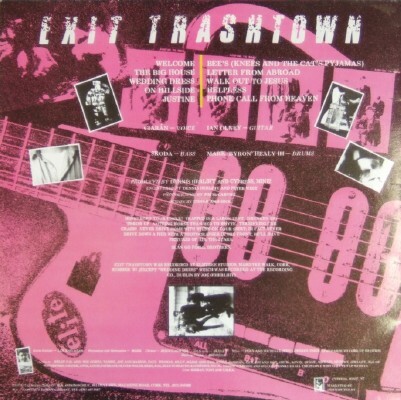 They regularly gigged outside Cork, appeared on RTE TV (including "TV GA GA" in 1986), played London (in 1987 and 1988 - one of these shows was reputedly videoed by someone in the audience) and their LP was released in the UK. 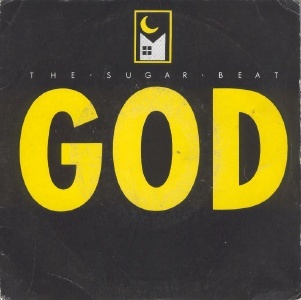 Their final single "Sugar Beet God" sold well enough to be played by Larry Gogan during his lunchtime show on RTE. But the big break never came and the band split up. 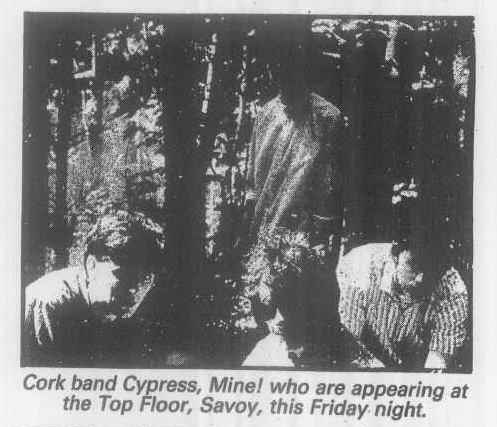 A post Cypress Mine band called the Dancing Bastards from Hell played on special occasions at different locations in Cork. The lineup variously included Ian Olney (guitar), Denis O'Mullane (bass), Morty McCarthy (of the Sultans of Ping) on drums, Graham Finn (guitar), Jim O'Mahony (Belsonic) on keyboards, Niall Twomey, and Mark Healy on vocals. 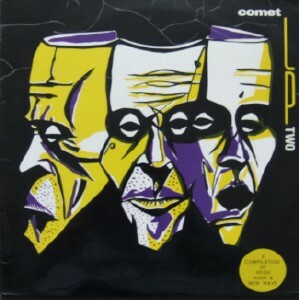 The band also recorded many demos during their lifetime, including many unreleased songs and in particular including a final demo tape which the band reckoned was probably their best work. All this material remains unreleased. 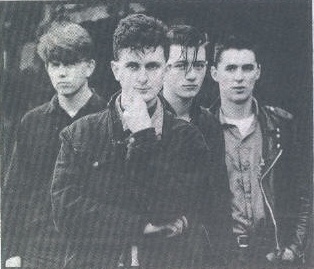 Ian Olney joined Power of Dreams in June 1990; Mark Healy formed Lift who recorded an unreleased LP in the early 1990s with Ian Olney, Graham Finn, Noel Quaid and Niall Macken. 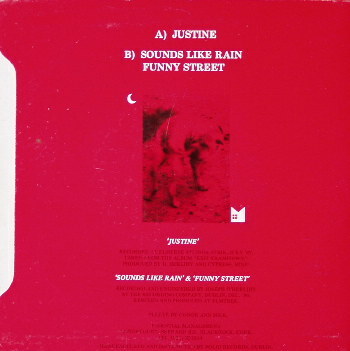 This 2-song demo tape was sold at gigs. There were undoubtedly other demos from this era but I have no further details about them. One was mentioned in the review column in Hot Press. It included the song titles "The Bible - Part 2" and "The Rifle Range". These were not made available commerically. Recorded at the Recording Company, Longford St. Little, Dublin. 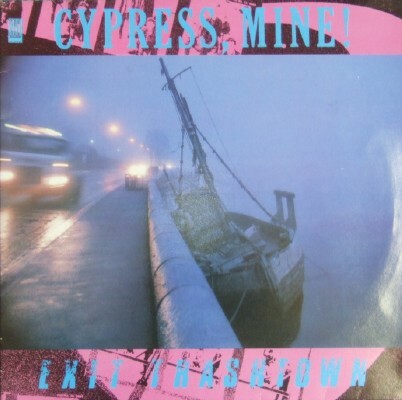 The LP title refers partly to emigration and partly to a place in County Cork called Thrasherstown. 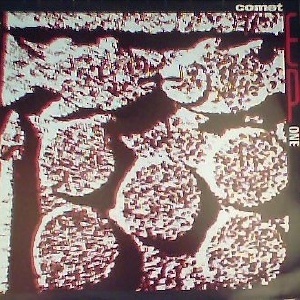 Recorded at Elmtree Studios, Cor in April 1988. A video for "Sugar Beet God" was filmed in London by Rod Fairweather of Super Channel and was probably aired on Transmission -- anyone know for sure? Anyone tape it??? 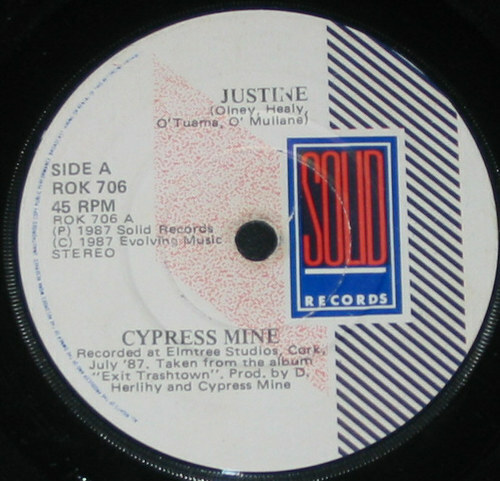 The B-side remix is described on the back cover as the three and a half minute murder disco mix.